Easy to setup and manage by you! Ticketing with full control and all features that you need and love! Sign up now (1 minute), go to your new website, follow the walk-through or video tutorials, customize the website and create your event. You can go live and start selling in minutes. Powerful seating chart designer allows you to create any amphitheater style, round-table (dinner style), night club style or any combination and allows the buyer to pick their seat. Simply create any single event or use the powerful scheduler to create a recurring event, classes or daily admissions. Package events into packages or season tickets. Use your own payment processor or PayPal or simply get a new one so you will receive the sales money as you sell, before the event. We offer best rate in the industry. No quote or contract needed. 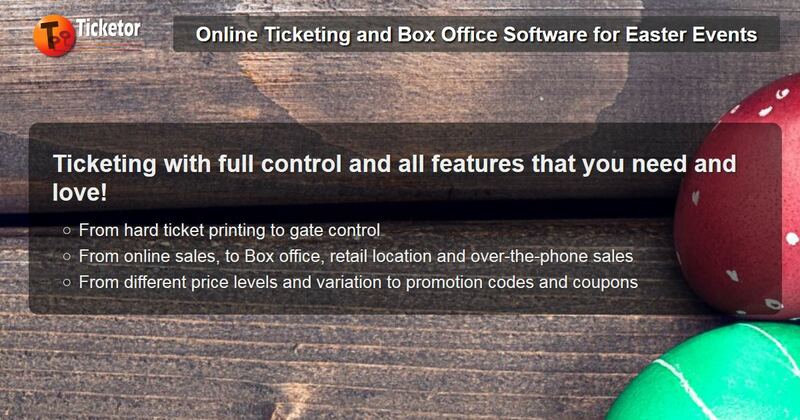 Use the touch-friendly, POS (point of sales) page to sell tickets at your ticket booths or as many retail locations. Sell in cash, checks or credit / debit card. Print e-tickets or hard, thermal tickets and hand them out. Use credit card reader for faster operation. Run your box-office with no extra equipment or use professional thermal printers and card readers. Accept cash, check or credit / debit card in face-to-face transactions. You and your sales staff can sell tickets over the phone and accept credit card. The tickets can be set to either get emailed to the buyer, or put in will-call booth. We support all delivery methods. Use physical tickets or e-tickets. All e-tickets and physical tickets have barcode and QR-code. Simply use your smartphone or a professional barcode scanner to scan and admit the attendees. Simply design and brand your site, upload your logo or background image or just select one of the pre-designed themes. Even move the site to your own domain. No technical expertise required. Post and share your events on social media. Integrate them on your website. Allow Facebook login and start the sales directly from your Facebook page. The buyer can pay with any major credit card or PayPal and the money goes directly into your own bank account or PayPal. Set as many price levels and price variations. We support multiple price-variations per seat. Create adult, kids, seniors, early-bird, ... prices. No limit on the number of events, venues and seating charts. Run as many concurrent events in as many venues around the world. Upload flyers, video and pictures for your event, create beautiful animated banners, or create gallery pages of your pictures and videos. We natively support most currencies including USD, CAD, EURO, GBP, AUD, .... so you can use Ticketor all around the world and for your international tours. Each event may have a different currency. Your website will be mobile-friendly and responsive out of the box. You can manage your events and buyers can buy on their phone. No additional app is needed. Create as many flexible coupons and promotion codes. Offer group discounts, package discount, time-based discount or individual discounts. Use the free mailing list feature to send emails to all your mailing list members, or just to people who purchased certain event, with templates that are filled with the recipient's information. Use your Ticketor website as a stand-alone ticketing portal or your official website, or embed it in your website or WordPress site. Ticketor is actually a website builder as well! Create as many administrator users, sales agents, event organizers and gate controllers. Limit each user's permission. All the reports that you may need including financial reports, sales reports, admission reports and audit reports. All reports are live and real-time and can be downloaded. Use the analytics module to integrate with Google analytics or use the tracking feature to measure your ads ROI. Ticketor has intuitive design and there are various walk-throughs, step-by-step instructions and video tutorials to make sure anybody can easily get on board. No long term contract. Simply sign up, start selling in minutes and cancel the account or change your plan at any time, right from your dashboard. How do you rate your experience with Ticketor? Great Way to sell ticket for my shows, events, etc! from: TT/Po Man Records Inc.
Mostly great and love having the online chat. A few enhancements would make it better! The european pricing is high compared to the US - currency conversion done at 1:1 rates. It would be good to have other language options and to be able to show a recurrence of a film in another language. We would be happy to help with spanish translations for the site if that helped. Support that is comprehensive and intuitive is magnificent. We have no regrets in using this application towards monetization success. These are the hardest working partners we have ever been associated with! Our biggest issue was our umbrella event ended in the middle of our event. It was our fault or lack of understanding that the thru date would go thru the 17 not end at 12:00am on that date. There should be a default that will not let you end it before your events. I should have put in 12/18. I was left with no idea where people were seated and blindly assigning seat with my fingers crossed. Not a good feeling or customer service. Interface is a bit tricky but support and Sam have been awesome! They all have been awesome! Easy set up for our first show, and the fee model is very fair. Very helpful. I enjoy working with sam. We are a start-up children's performing arts theater, but Ticketor treats us like we are much larger. Thank you Ticketor for helping us gain momentum. We love you guys! I love the price and really appreciate the chat support available at any time. Easy to use. Fast and Easy to set up. We have an Awesome Support Engineer! Sam is always incredibly helpful & prompt with his responses! I'm very happy. Everything is easy to do. Easy to set up, cost effective, gives the user full control of he sales aspect of their productions and events. by: Homeless Warriors Charity Inc.
How do you rate Ticketor's support and your dedicated support engineer? Cannot fault it though it would be nice to have someone in my time zone. Its very intuitive and responsive to our needs. Super helpful and responsive, thanks, SAM! Sam is the man! I wished that rhymed! The site is easy to manage and when we can't figure something out, Sam has the answer. Sam is fantastic - I asked a bunch of questions as I was getting set up and learning the system...he was incredibly responsive and helpful the entire time. If nothing else, the level of support that I received is probably the single biggest thing that makes me want to use Ticketor for future events. Sam was helpful as we navigated the site and setting it up. But when I had people at the box office wanting seats and not able to see the seats he said you weren't open on the weekends. Review the strand. A system fix or review by an engineer should be done. Sam is Awesome with the quickness with his answers. And if I don't get something clearly he will explain it a different way that I do understand. wow! you actually have someone at the click of a chat that will help you in real-time... i clicked for help and Sam was right there. i was very impressed with the support process! Sam is great. Very helpful and patient. Was very helpful and quick, gave me the exact answers I needed to setup my account quickly! Other companies need to get with the program like you have. Sam makes sure I understand and is patient with all my questions. He gets back to me in a timely manner. How do you rate the end-user (buyer) experience with Ticketor? The aesthetics are a bit outdated but still nice! Always had good reports from our customers which is good for us and good for Ticketor. Win Win! None of our customers are having issues. This is our 2nd big concert through Ticketor and no issues to be had. I wish there was an option that the person buying tickets didn't have to start an account. It is simple to get tickets and checkout is easy. How likely you will recommend Ticketor to others? Would you write us a testimonial here? Im already recommending people to use Ticketor! So far, I would definitely recommend. Lovely to be able to get started immediately and see what you are dong on site. I was very impressed by the variety of templates and tools to get my first ticketing website to do what I needed it do. On top if that, having responsive chat support was incredible. 5 stars! 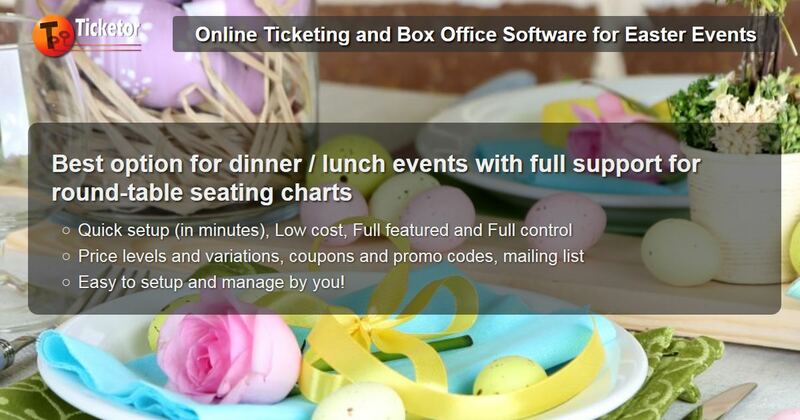 Ticketor is easy to use, with great support when I need some help. They make my life and my customer's life easier. I already recommended Ticketor to our church. Ticketor lets you create accurate seating layout for your environment, it offers great reporting options and their customer support is fantastic. There are a few minor improvements I'd like to see in the UI, but I will definitely come back to Ticketor for our future events. Ticketor.com has been a huge help to our elementary school PTA. It's taken our event management from tedious and outdated to easy, current, and efficient. What used to take hours now takes only minutes to complete. I'm thrilled with our experience. We will use ticketor.com for everything in the future. Great platform to promote your event! Intuitive and easy to access and use! Very likely. Easy to use interface. Support is good. Haven't gone 'live' yet with a show booking but looks promising. Very good support service! Very easy to set up. If you need to sell tickets then this is the place. You can set up your site any way you like. Once you are done then the tickets sell themselves. Customers can ask you questions that go right to your email. You can use your facebook page to link to ticketor and then back to your facebook page. Set up your payment processor and the money goes right to the bank. It’s all going well, and I am very excited about the way it is improving our admin systems. I actually feel in control. Some events were fully booked by on-line booking within three minutes of the release time. We have also stood down our telesales team for Sunday coverage due to the scarcity of calls. Huge thanks to you for this system as it gave me the ability to use the funds in advance. I've gone from musician to show producer and artistic director because of Ticketor. I would never have gone that far otherwise. I'll always recommend you. Any suggestions, ideas, improvements that can help your experience with Ticketor? As above. Plus also this feedback on my screen is impossible to read as I have black writing on a black background! Keep working on the templates and top nav. The control panel is a bit large, and obscures the working site. I keep forgetting where to go to login, and it's strange that I'm re-directed to the welcome email to do so. Overall AMAZING! thanks! The only thing I can think of that would make Ticketor better is populating the website fields for me. When you have price variations, you need to allow questions to be asked ONLY on the variations. Such as, we have a variation for VIP Experience and offer T-shirts with it, so we need shirt sizes, but the program asks for shirt sizes for every ticket sold. That is confusing for customers and if we aren't closely watching it will be confusing when placing shirt order. Make it easier to replicate repeating events. I.E. all events at the specified time for the days I select in a given time period. Ticketor Responese: Thanks for your suggestion. We added recurring events so you can easily schedule your events to run daily, weekly, monthly or per custom schedule. More webpage 'themes' or customized page designs? Live support has me sold, will recommend to everyone I know. That and pre event payout is crucial.